Capacity: 80 to 200 kg. • Available Size - 10 kg to 300 kg. • Ideal for Dry and Wet Material. • Available STD / GMP Model. We are one of the most well-distinguished companies in the market that are into offering Vacuum Tank Mixer. S.S Mixing Vessel, Blade &Washer or M.S Vessel, Blades &washer to reduce cost with or without water jacket for mixing container. 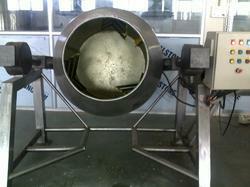 • Mixing vessel with heating control system. • Mixing vessel with PLC system. We hold expertise in offering wide array of Vertical Chemical Blender that is valued for high quality and durable performance. Our entire product range is abrasion resistant in nature and is offered in standard configurations. Chemical Blender is delivered in varied technical grades.